The brooks and streams draining water from the northern end of the Presidential Range Mountains are rich in cascades and falls. 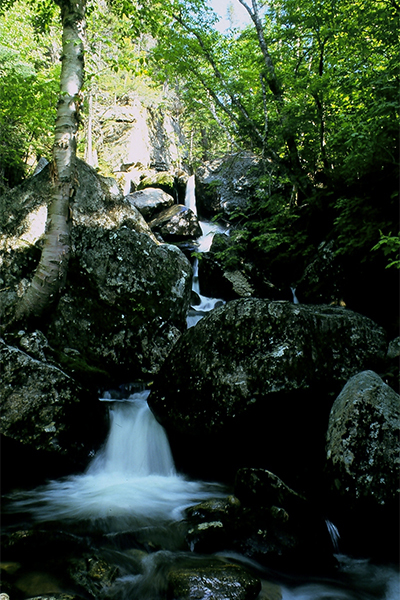 There are the Triple Falls on Town Line Brook, the waterfalls of Appalachia, as well as many unnamed cascades and falls. Three more waterfalls exist just east of Triple Falls (also off Dolly Copp Rd) along the Howker Ridge Trail. This includes Stairs Fall, Coosauk Fall and Hitchcock Fall, all of which are accessible via a mile long trail located in the small town of Randolph. The steps of Stairs Fall are blatantly obvious, and increase the expansion of the fan as the water travels down it. Heavily shaded and located on the other side of the brook from the trail, Stairs Fall is unfortunately too hidden for a photograph or even a closer inspection. Coosauk Fall is a 15-foot tall set of cascades and slides that dump into the Devil's Kitchen Gorge. There are old, bumpy paths leading into the gorge for closer views if you just so happen to see water flowing. Hitchcock Fall is the concluding feature of the trip. Here waters pigtail past boulders in the streambed into clear, green-tinted pools. Located in a secluded ravine that probably sees only a handful of visitors each week, Hitchcock Fall is a place best suited for intimate exploration. Many angular boulders are scattered in and around the brook, creating many opportunities to survey the area. Out of the three falls on the trip, Hitchcock is my favorite stop, more for the thrill of being alone in a rocky playground than for the actual impressiveness of the waterfall. From the parking area, follow the combined Howker Ridge Trail and Randolph Path through a field and into the forest. About 0.1 mile from the parking lot, take a left and continue on the Howker Ridge Trail. About a 0.1 mile further, cross an old logging road and continue straight. After a total of about 20 minutes, you will reach Stairs Fall, visible across the brook from the trail and currently marked by a small carved white wooden sign. Continue climbing upstream along the trail for another 0.1 mile and you will reach Coosauk Fall. A small, not immediately obvious, white sign will let you know that you have reached this waterfall. Up to this point, the trail has been an easy-to-follow moderate uphill climb of 0.7 mile. For the rest of the way to Hitchcock Fall, however, things are not so simple. The trail is hardly ever used, very narrow in some stretches, steep, and often has muddy sections. If you are seeking a waterfall offering the potential for hours of seclusion, Hitchcock Fall is one of your best bets. If you make the decision to continue to this final waterfall, fork left just past Coosauk Fall and continue climbing along the Howker Ridge Trail. About 0.1 mile beyond Coosauk Fall, fork left again as the Kelton Trail forks right. The falls are a few minutes ahead and are clearly identifiable from the trail. Upstream of Hitchcock Fall is the lost waterfall of Muscanigra Fall. Years ago, a spur trail led to the base of this elusive falls. These days, there is no trail and the bushwhack is said to be very difficult. It is also possible to connect Hitchcock Fall with the Appalachia Waterfalls. You will need a good trail map of the area to connect these two series of waterfalls. From the junction of NH 16 and US-302 in the section of Bartlett known as Glen, take NH 16 north. Continue traveling on NH 16 north for 3.4 miles past the entrance to the Mt. Washington Rd and take a left onto Dolly Copp Rd. Follow Dolly Copp Rd for 0.5 mile, passing the entrance to the campground on the left, and you will reach a fork in the road. Take the left fork onto Pinkham B Rd. Follow Pinkham B Rd for 3.8 miles to a U.S. Forest Service parking area on the left. On Dolly Copp Rd, there is a large parking area for the Presidential Range Rail Trail before the trailhead parking area, so be sure to look for the U.S. Forest Service “Hiker” logo sign. The trailhead parking area is 0.1 mile south of US-2 on Dolly Copp Rd. To get to Glen, take NH 16 north from Conway or US-302 east from the section of Carroll known as Twin Mountain.